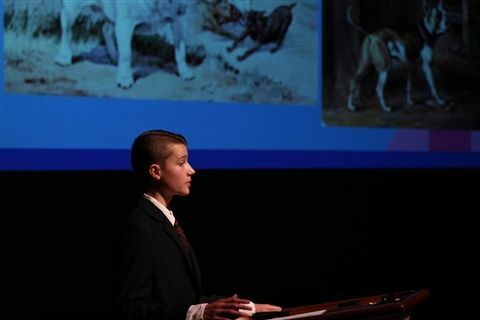 Seventh grader Sam Holthaus gave an engaging and informative presentation: “The American Pit Bull Terrier: America’s Dog.” He discussed misconceptions about the pit bull as well as its fascinating history. Sam’s love for dogs was contagious! Sam is a Junior Research Fellow, a middle school program that enables a student to pursue high-level research on a chosen topic. Congratulations on a job well done.